I finally started painting our interior doors. It has been on my list of things to do since before we moved in, and I really wish I would have done it sooner, like before we moved in! Better late than never, they say. Come take a look! I think you’re going to be amazed. Right from the beginning, I knew I wanted to get rid of the orange-gold color of all the woodwork. And we accomplished getting rid of a lot of it by painting or replacing all the trim in the house. We’re actually planning on changing all the trim, but we have more important projects to finish before we start that particular project. I never liked the orange tone of the doors and always wanted to change them. I’ve kind of been putting off painting the doors because a part of me wants to replace them with six-panel solid wood doors. But I realized, I don’t know when, or even if that is ever going to happen, and they just aren’t making me happy the way they are now. The orange finish on the doors clashes with everything. It has to go. The safe option would be to paint them white, but do you know what flat hollow-core doors look like when they’re painted white? Well, let’s just say, white paint can hide a lot of sins, except the sins of a flat hollow-core door. White seems to accentuate the fact that they aren’t solid wood. 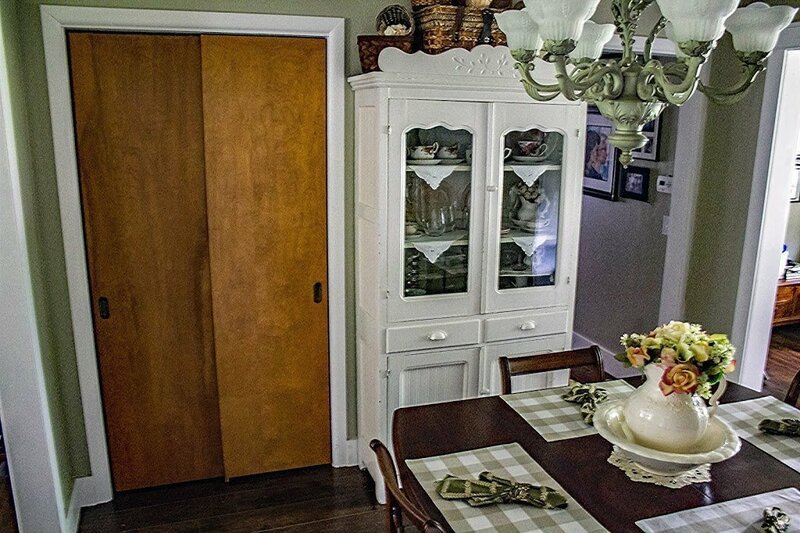 White doors need some kind of relief to make them look dramatic. The same isn’t true with black. Black is dramatic all on its own. I love how the doors look painted black! Anyway, I believe your home should make you happy, and since my doors weren’t doing that, I needed to get to work. I started by painting the dining room closet doors black this weekend. And you know what? I LOVE THEM!! Granted, they took too long to paint, and I had to redo one of the doors because the paint wasn’t sticking. But in the end, they turned out great. I don’t know why I waited so long to start. I might do one more coat on them, but for now, I love ’em and can’t wait to get going on the rest of the doors! 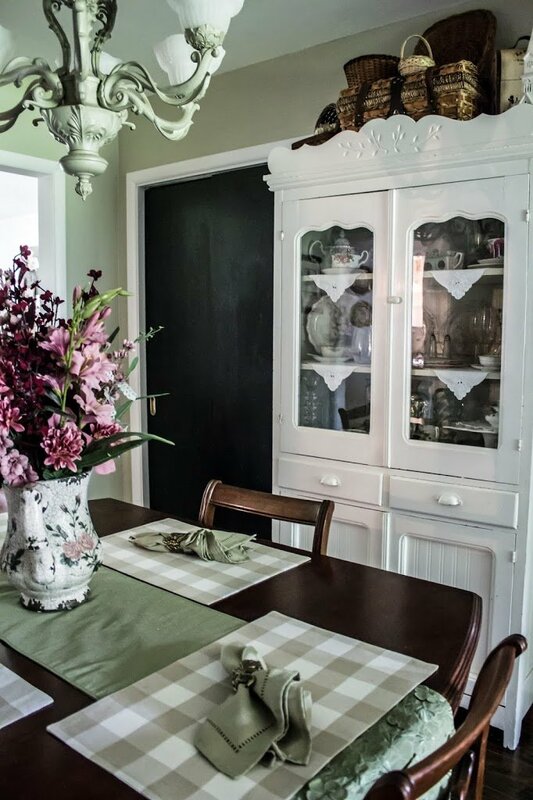 The black doors opened the room up and made my beloved china cabinet stand out. I wish I had taken a picture of the doors when I primed them, but I didn’t even think about grabbing my camera. Seeing them primed gave me a chance to see how the doors would have looked painted white. 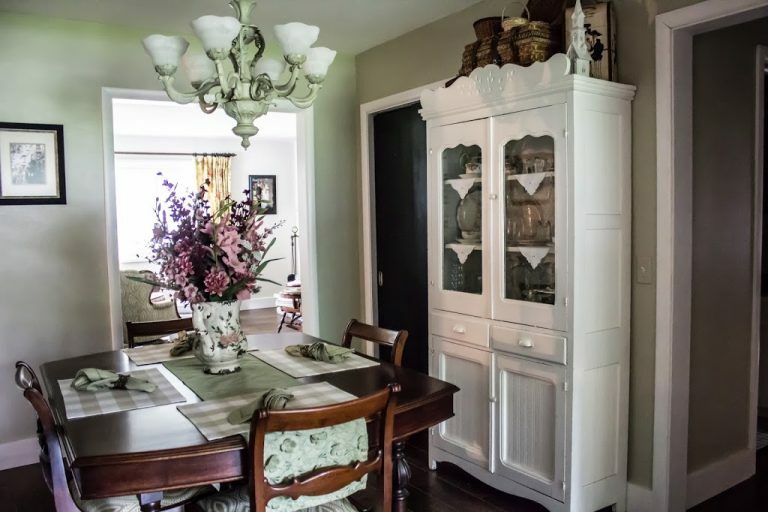 Surprisingly, they closed the space in and made my beloved china cabinet blend in too much.. Once they were painted black though, the whole room felt bigger and my china cabinet was center stage again! I still have eight more doors to paint, but now that I’ve started, I don’t think it will take me very long. I’m just too impatient now to let them go unpainted for very long! What do you think? 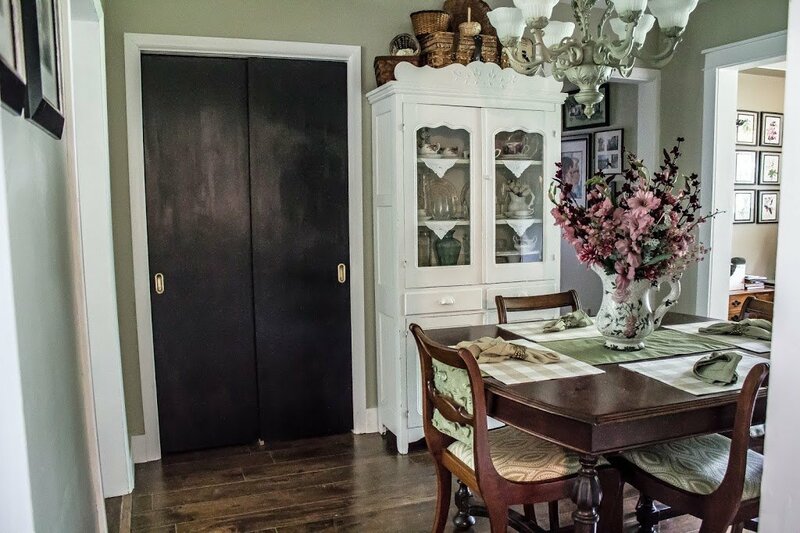 Are you brave enough to paint your interior doors black? I painted my closet doors and front door black as well a few years back. It's such a scary decision until you see how it turns out, the drama is to die for! I bet they look great! I know I'm loving my black doors! Thanks! I'm loving them too! Can't wait until they're all painted! !